Extreame Savings! Up to 43% off on Sports & Fitness at Round Of Golf. Top brands include Callaway, Milliard, & Cloud Flite. Hurry! Limited time offers. Offers valid only while supplies last. 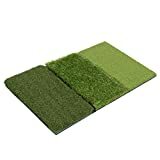 Milliard Golf 3-in-1 Turf Grass Mat Includes Tight Lie, Rough and Fairway for Driving, Chipping, and Putting Golf practice and Training - 25x16in.